The traditional features of wood fired heaters meet modern design in the new Timberline wood sauna stove. Engineered for efficiency and durability, our stoves are made of only the highest-quality materials, and our low prices make the Timberline wood sauna stove stand on its own in the wood fired heater marketplace. Before electricity was introduced to Northern Europe, saunas were heated naturally using wood burning heaters. This is still the preferred heating choice of sauna enthusiasts, especially when they appreciate the benefits of sprinkling water over the hot rocks. Wood fired sauna heaters have a chamber designed to be filled with special high-temperature rocks. These rocks absorb the thermal energy of the wood fire, and help evenly radiate the heat into the sauna room. One of the biggest benefits of using a wood fired heater in a sauna is that it requires no electricity. This means that our stoves are perfect for use in off grid cottage applications or remote locations, although a lot of our customers still prefer our wood burning stoves for their therapeutic benefits even when they do have access to electricity. The Timberline Wood Water Stove. Timberline is proud to introduce the wood fired sauna stove to our established collection of wood fired heaters. Our Sauna stove is designed in two parts, an internal wood fire box made of thick steel that captures heat, and an external box made of top quality stainless steel that gives the heater an appealing look while preventing rust. Our sauna stove also includes a ceramic infused heat resistant glass door that allows the fire's soft glow to illuminate the sauna room. A removable ash catcher is supplied to allow the ash waste to be easily removed. Our sauna stove also includes a top box that is designed to fit 25lbs of our special high temperature sauna stones. This stove can be installed into a sauna as quickly and effortlessly as lighting the internal wood fire that heats it! In the last few years Timberline has become a common name in the wood fired spa heater market. Our stove's are engineered to balance the traditional features of wood fired heaters with modern design, and our economic prices and superior build quality make it difficult for other manufactures to compete with us. Designed to heat 650 cubic feet of sauna space. Stove external dimensions -height 29" x depth 16.5" x width 13.75. Wood fire chamber dimensions- height 15" x depth 15" x width 12. Ash catcher dimensions- height 3" x depth 14" x width 6.5 - Holds approx. 273 cubic inches of ash. Fits maximum of 15 logs. Fits 25lbs of Northern Lights high temperature sauna stones perfectly. Heating time - Approximately 30 minutes. Dimensions of top stone box - height 7"x width 7" x depth 6. Chimney port exit - top. Chimney port diameter - 6. High quality stainless steel exterior wall allows for a rust free appearance even when exposed to outdoor conditions. Stainless steel exterior walls are separated from interior heating box and are vented to efficiently radiate interior heat whilst lowering the stove's exterior wall temperature. Rounded exterior corners give stove a sleek look and allows for safe and easy installation. Interior heating box made of thick and durable steel designed to absorb the heat and evenly radiate it into the sauna space. Interior heating box coated in high temperature resistant paint that protects and extends life of interior steel. Top facing sauna stone box designed to work perfectly with Northern Light's special high temperature sauna stones. Our sauna stoves are completely safe to use with water, we recommended that our customers pour water onto sauna stones while using stove as the hot rocks will produce steam which effectively heats and relaxes muscles while expelling toxins stored in sweat glands. Special high-heat resistant glass door separates fire wood chamber and allows light from fire to illuminate interior of sauna creating a rustic atmosphere. 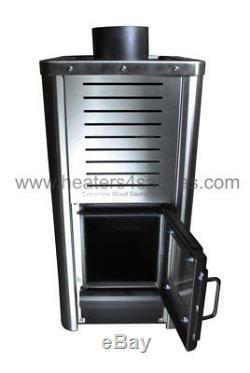 Features a removable ash catching tray for easy expelling of ash waste in stove. Top mounted chimney port designed to efficiently eject smoke upwards. Ideal for cottages and remote areas with no electricity. Mainly used for Barrel or Log outdoor sauna rooms. Sauna stones & chimney pipe are not included. The item "Timberline Wood Sauna Stove Stainlesss Steel Sauna Heater Heats 650 Cubic F" is in sale since Monday, June 6, 2016.